What do you do at night in Guangzhou? If you really want a taste of Chinese culture, I guess you can try seeing Cantonese Opera. If you really want a taste of Chinese beer, then Tsingtao is a low alcohol and sweet popular Chinese brand of beer. It was originally brewed in Qingdao by Germans. You might also want to try a Pearl River cruise in the evenings. This style of opera is popular in Guangdong, Guangxi, Hong Kong and Macau. The dialogue and singing is in Cantonese. The voices rise and fall in ever changing rhymes, and the melodies are harmonious and graceful. The people of Guangdong Province and large parts of Guangxi Province were mainly Cantonese speaking people. 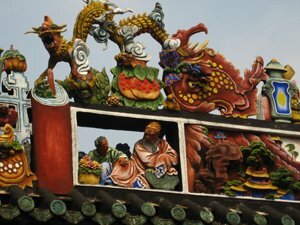 Cantonese is a language that is very different than Mandarin. 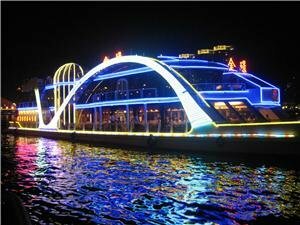 An evening cruise on the Pearl River is one of the tourist highlights in Guangzhou. The Pearl River is China&apos;s third longest river. By the time it reaches Guangzhou, it is highly polluted. 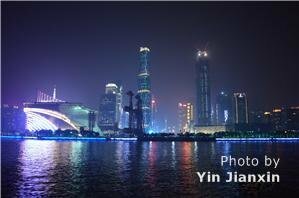 But there are lights along the river, and lit-up buildings of the Guangzhou skyline near the river make the place colorful. Some very tall buildings with interesting designs have been going up in Guangzhou recently. Perhaps the best restaurant is a restaurant boat called the Information Times. It has buffet dining and exotic music and dance entertainment. It seats about 300 people. The Tianzi No.1 holds 250 people. The Bright Pearl of Flower City is a luxurious ship. It has a banquet hall and also holds about 250 guests. There are three piers in Guangzhou: Dashatou Pier (大沙头码头), Tianzi Pier (天字码头), and Xiti Pier (西堤码头). If you are staying in a starred hotel, check on cruise information and getting tickets. The ships cruise between White Goose Pool and Guangzhou Bridge. The scenery along this part is fascinating with jade-colored water and colored lights on shore.